Gecko Galz Trick or Treat Blog Hop With an Extra Sweet Freebie Here! And a word about the Studio's future. This is your Thirteenth stop on our Tricks and Treats Blog Hop! Also make sure you leave a message on each blog site you visit and on the last blog there will be a phrase that you will email to us to be entered in our drawing for a wonderful treat pack. So sit back, relax, take your time and enjoy the hop! · First is a Gecko Galz shopping spree for $100! · Second prize is a $75 Shopping spree with Gecko Galz. · Third prize is a $50 shopping spree! · And our Grand Prize ONE FULL YEAR of Gecko Galz PRODUCTS!!! This includes the 6 new collage sheets each quarter, a new stamp set each quarter, 2 new paper packs each quarter, a ATC collection each quarter, and one jewel it collection! This is a $150 value! First of all, you will need to visit all 18 blogs and leave a comment on each blog :) **This is important so we know you have been to all the blogs **. Collect the phrase at the end of the hop on the Fripperies and Butterflies site there will be a link to email the phrase to Gecko Galz at geckogalz2014@gmail.com. This enters you in the contest. On October 31st we will randomly draw the 4 winners and email each of you, then we will post the winning names on the Gecko Galz blog site. This is my LAst post as a designer for Gecko Galz, It has been a great year working with the team! I have enjoyed the beautiful graphics and challenges. Thank you all for being apart of this chapter and now, Forward! Wow...love this whimsical and colorful sheet of retro birdies. Thank you for sharing. Great design team samples. Oh my, I love the free bird song sheet and the lovely card you've made with it! So, so pretty! Beautiful projects, Ginny. So sorry that you are leaving the Gecko Galz DT - wishing you all the best! 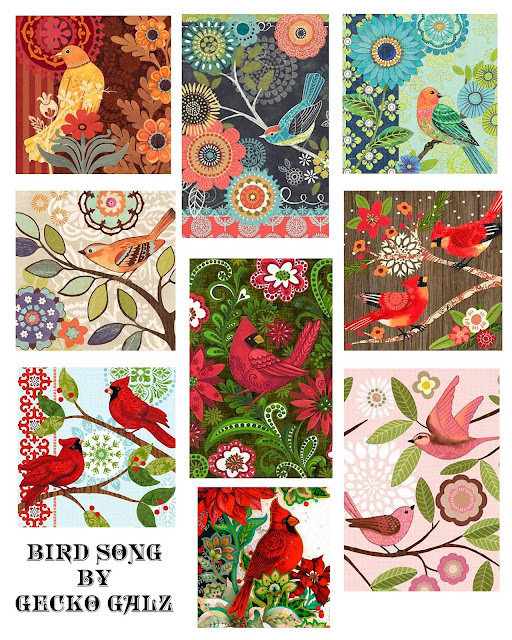 Thanks for the Bird Song collage sheet! Beautiful creations with the bird collage sheet! Great blog hop! Your samples are just beautiful with such vibrant colors! So very proud to be a part of this hop with you! And thanks for sharing this collage sheet - I'm super stoked to add it to my collection! What a great group of cards! The designs are beautiful! 13th stop in the hop and a lucky number LOL! Absolutely love your creations, and thanks for the nlog hop opportunity. What a wonderful colorful images and cards, gorgeous. Thank you for the freebie. Beautiful examples!! Thanks for sharing!! Thanks for sharing. So lovely! Gorgeous designs! Happy to be blog hopping with everyone and what a treat to be able to add these lovely collage sheets to my Gecko Galz collection! Such a sweet bohemian feel to these birds! Nice clean lines and very cheery. Such bright and colorful cards - really pretty!!! Love those birdies ... they look like tiny tapestries. Stunning creations with all the fun bird images!! Love it! Wonderful cards, thank you for the collage sheet. wow, this is such a vivid collage sheet. great projects. I love this collage sheet, thank you and I love your projects! You will be missed, Ginny! I love the way you've used these stylized images. You do gorgeous work! Thanks for the lovely collage sheet, too! Happy Halloween! This collage sheet is lovely and I love what you did with it. Thanks for the collage sheet and the hop. I love looking at everyone's creations. How do you download the sheet? I really like it and your cards are lovely! How to Brighten Someones Day!